Are you a regular online recharge doer? 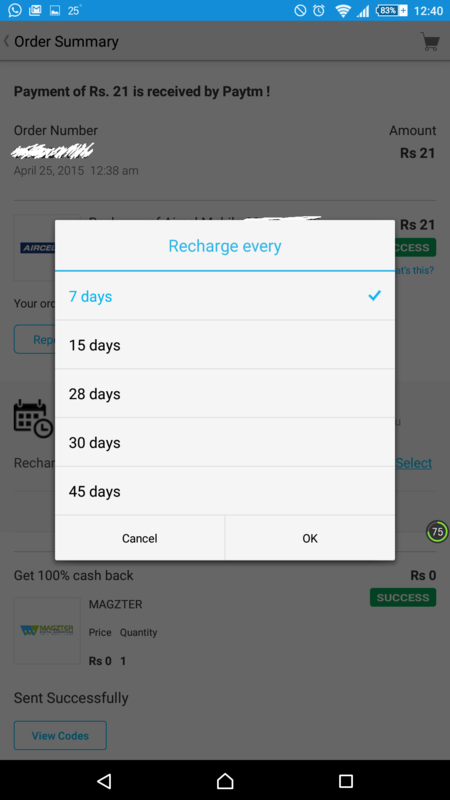 Do you recharge your friends and family from your paytm account? Then you must be getting regular queue of recharges from them. Often we have local calling plans or monthly rate cutters enabled on your mobile phones. These offers gets expired after 4 weeks and often we forget the validity. Often this may come to your mind, what if I could schedule my mobile recharges regularly and it would recharge the numbers automatically? Thanks to paytm, we are able to share the good news with you all: Yes! Now you can schedule a recharge. 1. 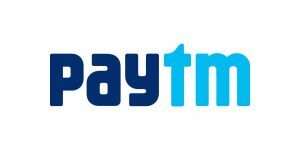 Update PayTM App to its latest Version. See your google play for an update. 2. Download and install the app. Now proceed to do your scheduled recharge. 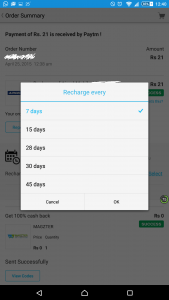 Remember, you need to do the recharge at least once to enable paytm repeat it for you every month. 3. Enter your mobile number, operator, and amount. Click Proceed to Payment. 4. On the next page, choose some coupons if you need, or enter any promocode you want to apply. Finally click Proceed to Pay. 5. Pay the amount using available payment methods and complete the transaction. 6. On the order summary page, you can see an option to auto-recharge the number for you. 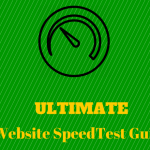 You can even choose after how many days you want the recharge to be renewed, options are 7 days, 15 days, 28 days, 30 days, 45 days etc to allow you choose conveniently exactly how much validity you need. 7. 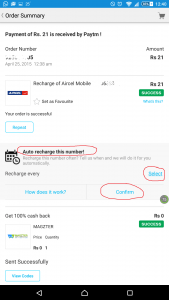 Select the interval and finally click on Confirm to confirm your paytm automatic recharge schedule. 8. On the net page, you need to Add a credit card. 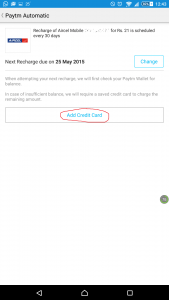 This is done to ensure that in case you don’t have sufficient wallet balance to carry out recharges, the money will be debited from your credit card and you will not miss your recharge. 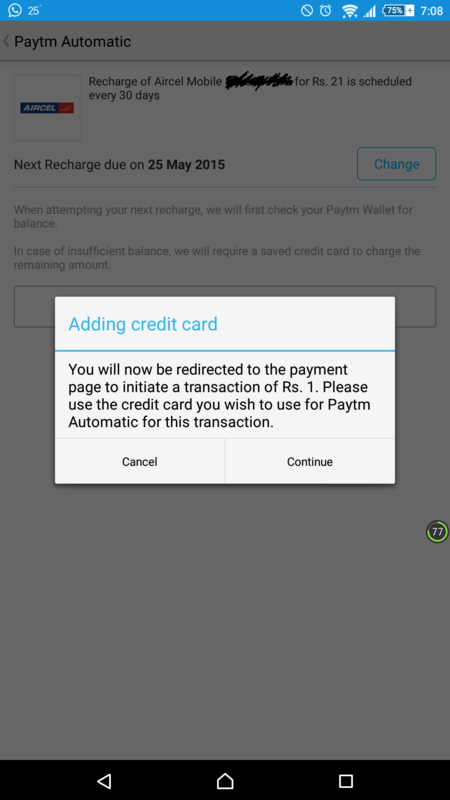 Remember, adding a credit card is mandatory, else the paytm automatic will not start. 1. 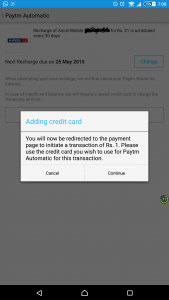 Go to your account section and click on PayTM Automatic. 2. You can see your scheduled recharge details there. You can cancel it anytime from there. 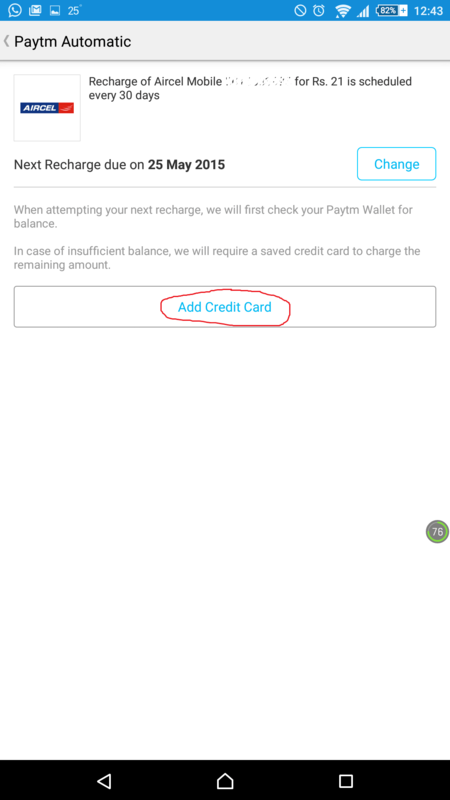 PayTM will check your wallet after your preset interval and will auto recharge your number only if your wallet has sufficient balance to carry out the recharge successfully. If you have insufficient balance, then it will use your credit card to deduct the charges. So it will ask you for credit card information. Another point to remember, that you will be charged extra Rs1 if your money was paid from a credit card. 1. Can I set up Auto Recharge without having to recharge at first? Ans: No. 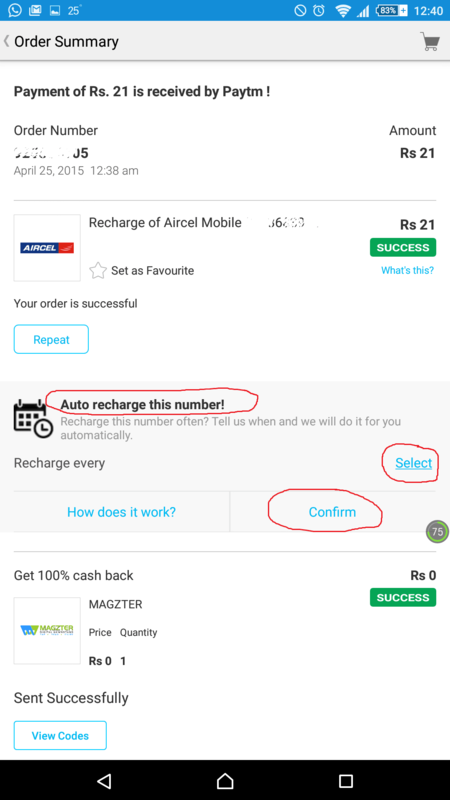 PayTM needs to repeat an order, hence it needs to have a successful recharge order first. 2. Can I use my net banking / debit card for it? Ans: Not yet. Currently supported methods are paytm wallet and credit cards in case the wallet balance is insufficient to carry on the recharge. 3. 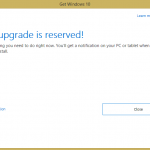 How long will you continue this scheduled recharges? Ans: Your recharges will be continued for infinite days till a recharge error occurs. If you need to cancel, you can do that from your account. 4. At what time the automatic recharges occur? Ans: All automatic recharges for the day will be initiated between 9-10 am. If not successful at the first attempt, the system will try again. That’s all. Thanks for reading. Do share if you like it. Keep visiting HiTricks.